An aspiring student may want to apply for a credit card to get a fresh start in the credit world. A credit card can establish a young person so that he or she can receive important credit products such as mortgages and auto loans. Capital One offers a student credit card that focuses on beginners. The Capital One organization has been providing credit products since 1988, and the company has always had lenient approval requirements. Capital One is the eighth largest financial institution in the United States. The Journey Rewards Credit Card is its current student card. 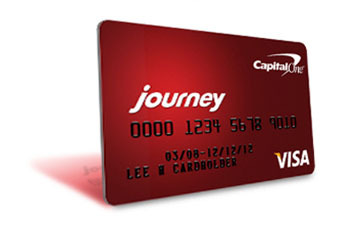 An applicant must be at least 18 years of age to apply for a Capital One Journey Student Rewards Credit Card. The person must be a resident of the United States, as well. The company is lenient in regards to the applicant’s credit score. Consumers have received approvals with credit scores that were as low as 582. The company understands that many of the people who apply for the Journey card do not have experience with credit products. Therefore, the approval rate for college students with no credit or low credit scores is high. The company usually offers a minimum of $300 as an initial credit balance. The Journey card has some delightful benefits for the emerging consumer. First, cardholders can earn cash back on their daily purchases, and the cash back amount never disappears or expires. The card issues a solid 1 percent back on all purchases. Additionally, a cardholder can earn an extra 25 percent bonus each month. The 25 percent bonus comes from the amount the person earns as cash back. The cardholder can earn the bonus once every month. Capital One treats its new cardholders with respect by allowing them to earn a larger credit line in a short period. A new cardholder would have to make five timely payments before Capital One would review the account. However, the individual may have access to $500, $1,000 or more depending on his or her credit score at the time of the review. Capital One Journey Student Credit Card cardholders can monitor their credit scores with the credit tracker that Capital One provides. The tool helps the consumers to understand the various aspects of their credit so that they can work toward raising it. Additional benefits of the Journey card include $0 fraud liability, extended warranty, travel assistance, car rental insurance and accident insurance. Fraud liability protects the customer if someone steals the card and uses it to make purchases. One of the best aspects of the Journey Student Rewards Credit Card is that the cardholders do not have to pay an annual fee. Capital One does not charge its Journey cardholders an over-the-limit fee, returned payment fee, transfer fee, or foreign transaction fee either. Furthermore, a cardholder will not have to worry about a penalty APR if he or she misses a payment. The company will assess a late fee of $35 for a late payment, however. Additionally, the consumer will have to pay a $10 or 3 percent cash advance fee for an advance. The APR for the Journey Student Rewards card is 19.8 percent, and cardholders have a grace period of 25 days on their purchases. Any person who is interested in applying for the Capital One Journey Student Rewards Credit Card will need to visit Capital One’s website and apply. The application process takes approximately three minutes to complete, and the company will most likely provide the applicant with a decision within 60 seconds of submission. The Journey Rewards credit card is a good product for a young consumer to use to build a strong credit history.